Anita Choudhrie walks into a ground floor reception room of her Belgravia home looking immaculate and pared down – no elaborate make-up, no bells and whistles, just simple elegance and poised demeanour. She is the originator of the family’s passion for art in the sense that she started collecting first and then inspired her husband, children and thaeir own families to the extent that each of them has developed an individual taste and a sub-collection of sorts. Certainly, they are all active in the Stellar International Art Foundation that comprises the collection. B Beyond met her for a conversation. BB: What does art collecting mean to you? AC: Art collecting is a passion – it comes from within. It is not something that you can cultivate or acquire and it certainly is not business motivated. I’ve always been very interested in the arts and in creativity. BB: Are you an artist? AC: I’m not an artist but I think I have an eye for interiors, decors, fabrics, colours – an aptitude for putting things together. I decorated this house myself – it reflects my taste and I am happy with it. Collecting is a life-long passion of mine and I am thrilled that I have been able to transmit it to my entire family – my husband, my sons and my daughters-in- law. It’s interesting to observe their awareness of the art world and how that evolves. They read up on things, they go to exhibitions and they make acquisitions. I’ve never sat down with them and attempted to lecture them on the subject – rather, art collecting has become a lifestyle and a passion for all of us and I love that. It probably started with my giving art works as gifts. The first painting we ever bought was at the Barbican Centre about 30 years ago. They used to have young artists exhibitions every year with people coming from all over the world to exhibit. It was a work by an Italian artist, called Ottavio that we still have at our home in India. My style of collecting has evolved since. I now try to collect as much as possible of a single artist, rather than buy random works. Even if I have an appreciation for something, I would not necessarily buy it for this reason alone. Before starting to acquire the works of a new artist, I would research their background, look at everything they have produced and take some time before I consider collecting them. 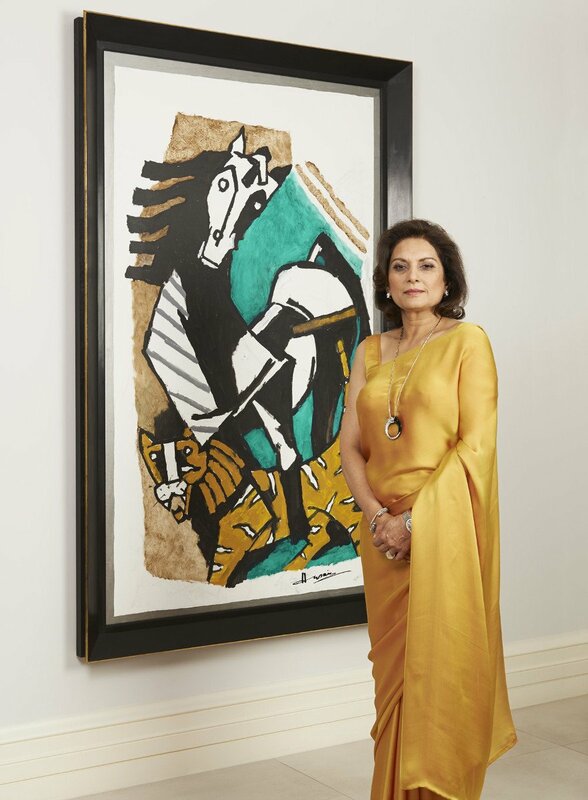 Over the last 35 years I have collected a lot of MF Husain, Paresh Maity, Jayasri Burman and some of them have even been commissioned to create 10, 12, 15 paintings to go with a story. MF Husain’s last few years of works were purchased by our foundation. He did draw us the cover of his book idea – a book we published posthumously to celebrate him and his body of work. He taught us a great deal about collecting: researching, outsourcing and acquiring pieces of the same period. He was man who liked few people and respected even fewer. As an artist, he preferred not to have to break up the body of his work and was looking for a collector he both respected and appreciated to become the custodian of his legacy. We also acquired his Ramayana series. MF Husain had a very clear vision and a sharp business mind. He was not a typical artist, divorced from reality – rather, he had a keen awareness of the value of his works and sold them accordingly (he did, after all, have a large family to support). This did not, however, detract from the value of his work or from the charisma of his personality. We created our foundation in 2008, just for the collection, with selected works being put on display regularly. We just took part in the Art Masters in St Moritz where we showed some 100 odd pieces, mostly by MF Husain from his 1950s period. St Moritz has been organising an art show every August for the past 7 years and we have been sponsoring them for the last 5. BB: When did you start collecting? AC: I started collecting about 35 years ago. It’s not something that my family cultivated, it was my own thing. I’d go and admire works at fairs but buying is very much a matter of personal choice. I like to follow a particular period. For example, with European artists I focus on the Art Deco period, as well as the ‘modern period’, i.e. from about 1936 to 1950/60. That’s my special interest and what I would buy. We have some amazing Russian artists whose works we bought from a gallery and I have some icons, which I love and keep at home in India. BB: How large do you envisage the collection to grow? AC: I don’t think it will ever stop growing because my children, who enjoy arts a lot, are going to take over and will continue to acquire works. BB: Do you have anyone advising you in terms of purchases? The perception out there is that major art collectors always have an advisory committee. But the majority of people I meet know exactly what they like. Let’s say that an artist decides that his works would fit in well with your collection, how would they go about approaching you? AC: It would be by way of introduction. As you know, the art market is huge, but there probably aren’t a lot of very good artists to fit serious collectors’ specific requirements. There are a lot of mediocre and poor artists who manage to sell but good artists do not need to pander to, or impress collectors – their work speaks for itself. BB: Would you pluck someone from complete obscurity if you liked them well enough? AC: I am not terribly keen on contemporary art. I think the method contemporary artists use for applying paint on canvas is completely different to how it was traditionally done. A lot of it is photographic. I enjoy looking at beautiful things and would walk into a fair, show or exhibition – I try to go to most in this part of the world – but I think the majority of works out there are to enjoy rather than to buy to add to the collection. Amongst the contemporary artists whose works I appreciate and enjoy greatly are Botero and Britto. A friend introduced me to them and now, I would go and see them and would buy something if I like it very much. I don’t buy on an impulse, ever. I don’t want to just fill up my walls with artwork. If you just look at art from an interior design perspective, you have to see what looks good in terms of space, colour schemes or how the works fit in with the overall interior of your home. But I don’t treat art so frivolously. I think of art as a subject you have to study. If you’re going to invest time, effort and a lot of money into it, why would you go and pick up something at random, on an impulse? BB: Do your children share your taste? AC: I believe they do most of the time. If it’s something they don’t perhaps like, they would still appreciate the fact that I do and would not say anything. Similarly, I respect and appreciate their taste. When they bought Warhol’s Mao’s, for example, I thought ‘that’s nice’. It is not something I would buy, but I appreciate it on their walls. They are developing their own tastes. I admire the fact that they have the confidence to make their own choices. BB: Will you ever have a permanent home for the collection? AC: I hope so – both here in the UK and in India. But it will take another 2 or 3 years before we begin to pursue this. BB: What, according to you, is the definition of art today? AC: I think art critics are largely responsible for distorting the perception of what art is today. I believe there should be boundaries between true art and pretentious works that parade as art. This would also give artists a better chance for recognition, more space and better opportunities to exhibit their works. There needs to be a proper definition and limitation of what art is. Art traditionally has always been paint and canvas, paint and paper, which is where most of the hard work and creativity come into play. Creativity that is in the mind is just the manifestation of an idea. BB: What else do you do apart from collecting art? AC: My foremost “project” in life is being a wife and a mother – and now a grandmother. I adore my family – they come first and before anything else. I also do some philanthropy work, which takes me over at times. I have a personal philanthropy project both in the UK and in India that is hugely important to me. It started with me becoming a patron for a disability school in India which is beautifully run by a lady with whom it is a real privilege to work. She acquired a small piece of land with a government grant on which she erected a tent for 5 disabled children. She went on to develop her own educational system that has been so successful that other countries and governments are now asking her to share it with them. She’s just been invited by the Mauritian government to help them establish a similar school for physically challenged children. There are now about 500 children in the original school and she teaches them occupational works and skills that serve them well in life, as opposed to simply giving them a diploma. The school celebrated its 25th anniversary and I am helping them raise funds to set up a new one. I registered a charity in the UK 8 years ago, a foundation called Path to Success, which supports them, as well as a new charity I adopt every other year. 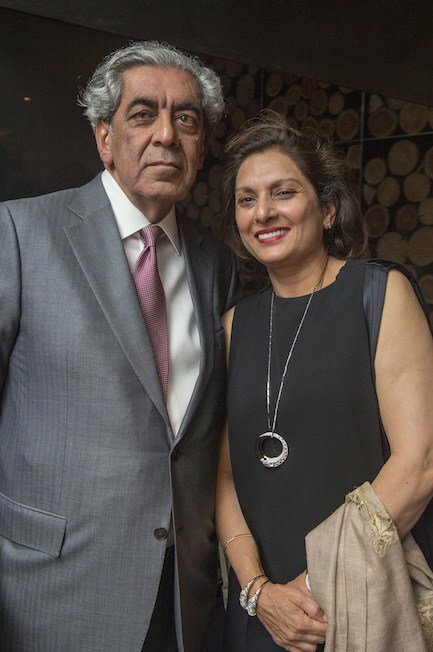 The Stellar International Art Foundation was established in 2008 and took as its basis the private collection of the Choudhrie family. Currently the Foundation comprises over 600 works by an array of Indian and Western Contemporary artists ranging from painting to sculpture. The collection began in the 1970s when the Choudhrie family began to purchase works of art. This led to intimate relationships with some of India’s most important contemporary artists including M F Husain, Paresh Maity and Jayasri Burman. At the point the Foundation was created, the collection changed direction to focus on Western and American Contemporary Art, selecting important works by the most important contemporary artists working today. The Foundation seeks to promote artists within the collection through international exhibition, loans, publications and events.